A rescue has taken place on the Firth of Forth after a number of people got stranded on Cramond Island. It is understood 15 people were taken ashore by the South Queensferry lifeboat. 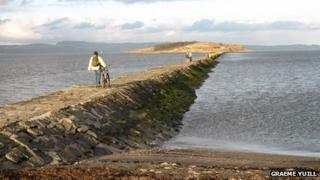 The island is accessed by a causeway which is covered by the tide. The rescue was co-ordinated by Aberdeen Coastguard, who said one group of four adults and two children were in shock after the sea reached chest height. One casualty has been taken to hospital in Edinburgh with an ankle injury. Meanwhile, a Royal Navy helicopter from Prestwick has been used to winch a 78-year-old man off Dumgoyne in the Campsie Hills in Stirlingshire, after the climber took ill with chest pains. The man has been taken to the Southern General Hospital in Glasgow. His condition is not known.